They competed during the 2017 spring sports season while performing remarkably well in the academic arena. They are the NEC Spring Scholar-Athlete of the Year award winners. Bryant, Sacred Heart, Saint Francis U and Wagner each earned multiple selections. Fairleigh Dickinson, Robert Morris and Saint Joseph’s are home to single honorees. Four all-Northeast Conference baseball honorees received an unforgettable phone call this past week. Bryant starting pitcher James Karinchak, Fairleigh Dickinson shortstop Matt McCann, Central Connecticut third baseman Ryan Costello and LIU Brooklyn infielder Andrew Turner were chosen in the 2017 Major League Baseball Draft. Duquesne’s AJ Hines won the NEC Rookie of the Week award 10 times in 2016. When Athlon Sports unveiled its Top 10 Running Backs in the FCS in 2017, there was a surprising omission from the main list. The name of the 2016 NEC rushing champion does not appear until the reader scrolls to the bottom of the page and looks over the “More Running Backs to Watch” section. 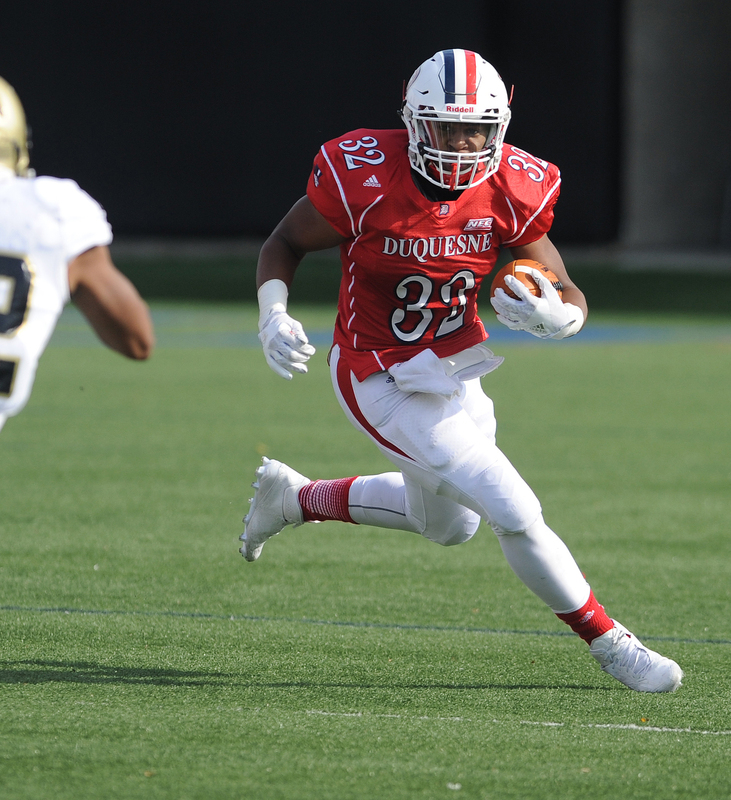 Duquesne’s AJ Hines is coming off a freshman season that saw him rush for a league-high 1,291 yards and 13 touchdowns while adding another 200 yards receiving. Only one man and one woman can hold the NEC Student-Athlete of the Year title. Four of the first 74 players selected in the 2017 Major League Lacrosse Collegiate Draft competed for Northeast Conference programs this past spring. Bryant was the lone team with multiple draftees. Bulldogs’ forward Tucker James was the first NEC alumnus selected in the Draft, going to the New York Lizards 52nd overall (Round 6). Five picks later, one of James’ collegiate teammates heard his name called. Bryant defenseman Kyle Mummau, the second NEC player taken, went to the Chesapeake Bayhawks via the 57th overall selection (Round 7). The pair of 2017 picks mark the fifth-straight season the Bulldogs have seen a player drafted in the MLL ranks. Right after Mummau went to the Bayhawks, the Rochester rattlers snagged Hobart’s Frank Brown with the very next pick (58th overall). Brown, the 2016 NEC Player of the Year, scored 81 goals in 58 collegiate contests. Sacred Heart’s Brian Masi heard his name called in Round 9, going to the Atlanta Blaze with the 74th overall selection.